The Ghana Stock Exchange has once again positioned itself as one of the best performing Exchange in the world. For the second successive year, the Ghana Stock Exchange (GES) recorded very impressive gains, with 2004 performance reaching another striking level of 91.32% year to date gain. 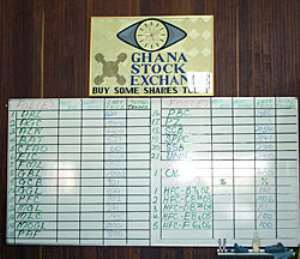 Though the year's gain did not match up to the previous year's (2003) 141.31%, the year 2004 will definitely be recorded in the annals of the Ghana Stock Exchange as a very memorable one during which major landmark events were recorded. During 2004, exciting and unprecedented landmark events took place on the GSE. The usual election year tradition of bearish market and low trade volumes regimes, was thrown overboard. During previous election years, investors (mostly foreign investors) shied away from the Stock Market. They most often remained skeptical and adopted wait-and-see attitudes. But 2004 witnessed one of the highest trades volume recorded on the GSE.